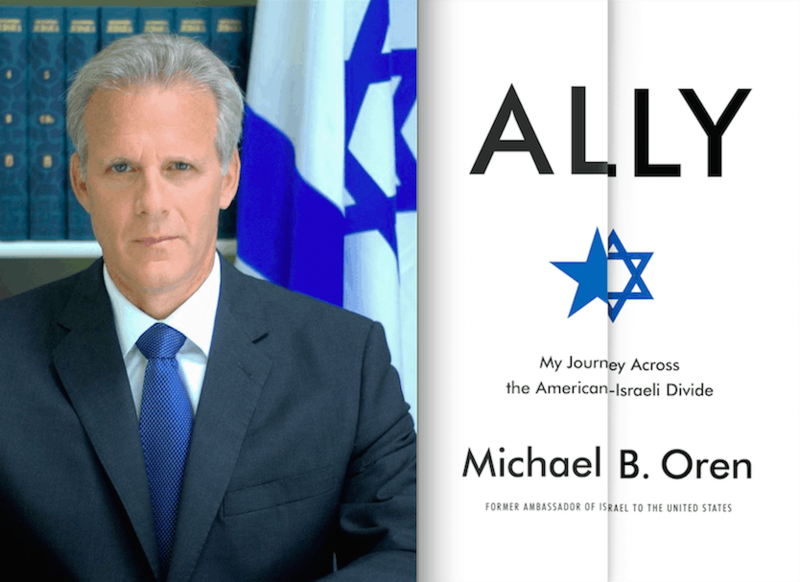 The webcast was hosted by the Jewish Federations of North America, and it occurred just before a meeting between Jewish leaders and President Barack Obama Tuesday, in which the president was expected to lobby for their support, or at least their silence. Bibi hoped to get his message out first. Without mentioning names, Netanyahu deconstructed many of the false claims about the P5+1 deal made by those in the Obama Administration. He explained how it didn’t prevent Iran from developing nuclear weapons during the deal if Iran cheats or soon after the enrichment provisions expire in 10-15 years, and explained that even the best intelligence agencies don’t find out about everything. Bibi also explained how the deal has already started a nuclear arms race in the Middle East. Perhaps Netanyahu’s fiercest objection was to the claim that the only alternative to the Iran agreement was war. Yet there’s one claim that is the most outrageous: that those who oppose this deal want war. That’s utterly false. We in Israel don’t want war. We want peace. Because it’s we who are on the front lines. We face Iran’s terror on three borders. We face tens of thousands of Iranian rockets aimed at all our cities. We face Iran, whose regime repeatedly calls for the destruction of the Jewish state. We face Iran whose terrorist proxies try to kill Jews every day. We know that Iran is not only the leading state sponsor of terrorism, it’s also the leading state sponsor of anti-Semitism. Israelis are going to be the ones who pay the highest price if there’s war and if Iran gets the bomb. The claim that we oppose this deal because we want war is not just false. It’s outrageous. He called for a bi-partisan opposition to the agreement, and reminded his audience that if Congress rejects the deal, the sanctions against Iran would not collapse, and war would not be inevitable. Rather, he said, U.S. sanctions would be strong enough to pressure Iran, and Iran would eventually come back to the table because it needs a deal more. Last the news came out that a top French diplomatic official Jacques Audibert, who led the French diplomatic team in the discussions with Iran and the P5+1 made the exact same point, that if Congress rejects the agreement, Iran will complain for a while, but they will eventually want new talks and the P5+1 can negotiate a better agreement because in the end Iran needs the deal more than the rest of the world. It’s good to be with you today. I want to thank our hosts, the Jewish Federations of North America and the Conference of Presidents. And I want to thank all of you for taking the time in the middle of a busy day. Our time today is short, so I’d like to get right to the point. I want to talk with you about three fatal flaws in the nuclear deal with Iran. And I also want to dispel some of the misinformation and, regrettably I have to say, the disinformation about the deal and about Israel’s position. I want to answer some of your important questions. The nuclear deal with Iran doesn’t block Iran’s path to the bomb. It actually paves Iran’s path to the bomb. Worse, it gives Iran two paths to the bomb. Iran can get to the bomb by keeping the deal or Iran could get to the bomb by violating the deal. First let’s understand how Iran gets to the bomb by keeping the deal. See, the deal allows Iran to maintain and eventually expand a vast and increasingly sophisticated nuclear infrastructure. This infrastructure is unnecessary for civilian nuclear energy, but it’s entirely necessary for nuclear weapons. Astonishingly, the deal gives Iran’s illicit nuclear program full international legitimacy. If Iran keeps the deal, in a decade or so – at most 15 years – the main restrictions on this vast nuclear program will expire. They’ll just end. The deal’s limitations on the number of centrifuges Iran has and on the quantity of uranium Iran enriches, those restrictions will be lifted. And at that point Iran will be able to produce the enriched uranium for an entire arsenal of nuclear weapons and it could produce that arsenal very quickly. After 15 years, Iran’s breakout time will be practically zero, just a few days. I think President Obama said as much in an interview with NPR. By keeping the deal Iran will become a threshold nuclear weapons power. The deal does make it harder for Iran to produce one or two nuclear weapons in the short term. But it does so at a terrible price. Because the deal makes it far easier for Iran to build dozens, even hundreds of nuclear weapons in a little over a decade. Now, 10 to 15 years pass in no time. I think it was like yesterday and I remember this very well, all those preparations for the Y2K bug and the celebrations of the new millennium. That was 15 years ago. It’s a blink of an eye. We’re told that this deal buys us time, but 10 to 15 years is no time at all. So by keeping the deal, Iran can get within a decade or so not just to one bomb, but to many bombs. But Iran has a second path to the bomb, one that would give it a nuclear weapon in far less time. You see, Iran could violate the deal. And there’s good reason to think that Iran will do so, that it will cheat. They’ve done it before. They’ll do it again. Now, people don’t really contest that, but they argue that Iran will be prevented from cheating because we’ll have good intelligence and unprecedented inspections. Well, let me start with intelligence. I have the greatest respect for Israel’s intelligence capabilities. I have the greatest respect for the intelligence services of the United States and Great Britain. But it has to be said honestly. For years none of us discovered the massive underground nuclear facilities Iran was building at Fordo and at Natanz. For years none of us discovered that the Syrians were building a nuclear reactor for plutonium production. So I can tell you from experience, it’s very precarious to bet the deal’s success on intelligence. Neither intelligence nor inspections prevented North Korea from building atomic bombs despite assurances that they wouldn’t be able to do so. And while the deal with Iran allows for ongoing inspections of Iran’s declared sites, what about Iran’s secret nuclear activities? See, under the deal, if a facility is suspected of housing a hidden nuclear activity, inspectors must wait at least 24 days – that’s 24 days! – before getting access to those suspected sites. Not only that, the inspectors must first share with Iran the critical intelligence that led them to suspect these sites in the first place. That’s actually astounding. Some have said that 24 days is not long enough to conceal evidence of illicit nuclear activity. But as leading experts have pointed out, 24 days is more than enough time to clean up a site of all traces of illicit activity. It’s like the police giving a drug dealer three and a half weeks’ notice before raiding his lab. Believe me, you can flush a lot of nuclear meth down the toilet in 24 days. I’ve heard the claim that the deal blocks Iran’s covert path to the bomb. But no matter how good your intelligence is, no one can credibly make such a claim. How can you block what you don’t know? So Iran can keep the deal or Iran can cheat on the deal. Either way the deal gives Iran a clear path to the bomb, a difficult path to one or two bombs today and a much easier path to hundreds of bombs tomorrow. Now, here’s the thing – everybody in the Middle East knows what I’ve just said. And the countries in the region threatened by Iran have already made clear that they will work to develop atomic bombs of their own. So the deal that was supposed to end nuclear proliferation will actually trigger nuclear proliferation. It will trigger an arms race, a nuclear arms race in the Middle East, the most volatile part of the planet. That’s a real nightmare! But the deal’s dangers don’t end there. See, the deal gives Iran also a massive infusion of cash and Iran will use this cash to fund its aggression in the region and its terrorism around the world. As a result of this deal, there’ll be more terrorism. There will be more attacks. And more people will die. It’s been said that most of the money that Iran will get will not go to Iran’s terrorism and aggression. Well, let’s suppose that’s true. Let’s suppose that Iran just takes 10% of the money for terrorism. That’s 10% of nearly half a trillion dollars that Iran is expected to receive over the next 10 to 15 years. That’s a staggering amount of money. And that would turn any terrorist group sponsored by Iran into a terrorist superpower. So for all these reasons –I ran’s two paths to the bomb and the cash jackpot Iran stands to receive – For all these reasons, this is a very dangerous deal, and it threatens all of us. My solemn responsibility as Prime Minister is to make sure that Israel’s concerns are heard. It wasn’t long ago, certainly not that long ago, that the Jewish people were either incapable or unwilling to speak out in the face of mortal threats, and this had devastating consequences. I’ve been very clear – the days when the Jewish people could not or would not speak up for themselves, those days are over. Today we can speak out. Today we must speak out. And we must do so together. Here in Israel, Isaac Herzog, the Leader of the Labor Opposition, the man who ran against me in this year’s election and who works every day in the Knesset to bring down my government, Herzog has said that there is no daylight between us when it comes to the deal with Iran. This is simply not a partisan issue in Israel. Sure, some people disagree, but overwhelmingly across the political spectrum, a huge majority of Israelis oppose the deal. So this is not a partisan issue in Israel. It shouldn’t be a partisan issue in the United States either. Nor is it a personal issue. This isn’t about me. And it’s not about President Obama. It’s about the deal. I’m asking you to rise above partisan politics as we in Israel have risen above it. Judge the deal on its substance and on its substance alone. The more people know about the deal, the more they oppose it. And the more people know about the deal, the more the deal’s supporters try to stifle serious debate. They do so with false claims and efforts to delegitimize criticism. We know that Iran is not only the leading state sponsor of terrorism, it’s also the leading state sponsor of anti-Semitism. Israelis are going to be the ones who pay the highest price if there’s war and if Iran gets the bomb. The claim that we oppose this deal because we want war is not just false. It’s outrageous. Israel wants to dismantle Iran’s nuclear program and Israel wants peace. This deal will advance neither goal. I don’t oppose this deal because I want war. I oppose this deal because I want to prevent war, and this deal will bring war. It will spark a nuclear arms race in the region and it would feed Iran’s terrorism and aggression. That would make war, perhaps the most horrific war of all, far more likely. Don’t let the deal’s supporters quash a real debate. The issue here is too important. Don’t let them take your voice away at this critical moment in history. What we do now will affect our lives and the lives of our children and grandchildren – in Israel, in America, everywhere. This is a time to stand up and be counted. Oppose this dangerous deal. 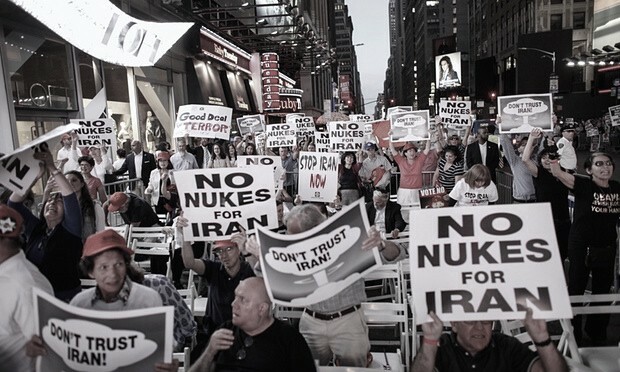 Times Square Anti-Iran Deal Rally Draws Record Crowd, Will Congress Listen?